Sundials are perhaps one of the most ancient scientific tools in existence, and are also one of, if not the earliest form of keeping time. Once an essential tool in keeping time, sundials have now become a decorative accent, and functioning tool in outdoor and garden environments. Sundials can vary from basic designs, to the complex. A vertical pole is the most basic form, and more complex forms can include grids as well as intricate details. 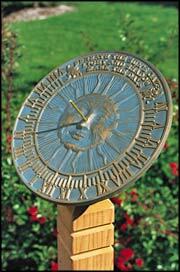 Whichever design you use, all sundials operate with the use of the sun and the shadow that is cast by the sun. With the modern technology that we have today, it can be fun and a learning experience to step back in time and calculate the time of day by the use of nature and the natural cycles of the Earth.Sundials can be found in all shapes and sizes. You may want to even build your own. There are also large sun-dial sculptures that can become center pieces in a yard or garden, as well as those that can be smaller accent pieces in the yard or patio. Sundials can be found in all shapes and sizes. You may want to even build your own. There are also large sun-dial sculptures that can become center pieces in a yard or garden, as well as those that can be smaller accent pieces in the yard or patio.